The big crowd who gathered at The Karting Arena for the third edition of the Odlo Cool Sprint Challenge powered by HolyCrit last Saturday witnessed a fitting end to an exciting night of racing as Muhammad Shafiq Muslim (Mayhem) out-manoeuvred local hero Elyas Yusoff (Cycleworx) late on the last lap to emerge as champion of the Road Bike Men’s Open after a real ding-dong battle. 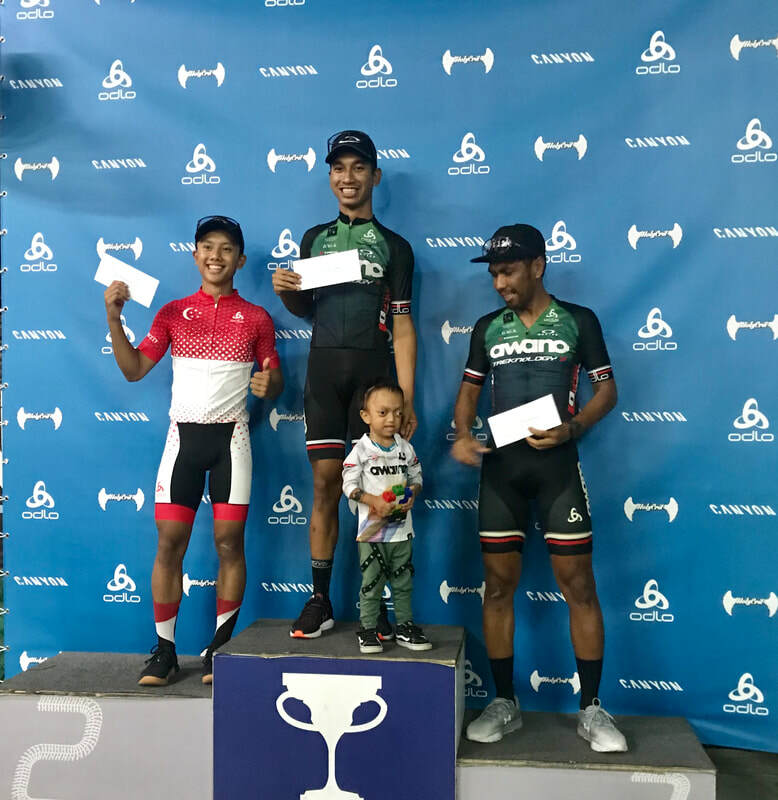 It was Shafiq’s second successive time in the HolyCrit winner’s circle having won the fixed-gear race at the last Odlo Cool Sprint Challenge in September 2018. But the Kuala Lumpur-based rider’s decision to go roadie and not defend his title didn’t take any sheen off the fixed-gear division on Saturday night as the latter had its own dose of international star power in the shape of Jonas Fischer (Canyon Rad Pack), a member of the famous fixed-gear outfit Rad Race. 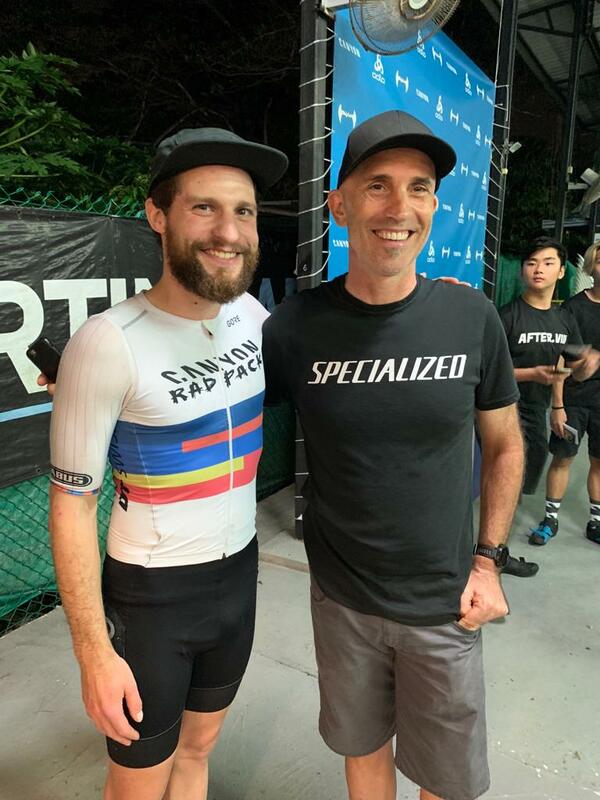 It was a master stroke by event co-sponsor Canyon Bicycles to bring Fischer over to Singapore for Saturday’s race, with the bearded German wowing the big crowd with his skills on the track, but also charming both the fans and his fellow competitors with his easygoing manner off the track. 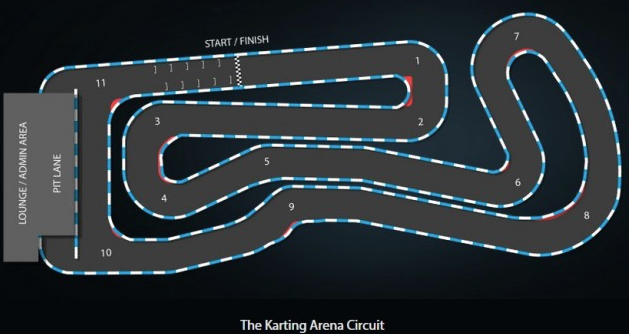 ​​The Karting Arena in the sprawling Turf City leisure complex is quite a small facility, but at its heart lies a little gem; a roughly 500-metre long racing circuit that, as its name implies, normally plays host to kart racing. The track is super smooth, but tight and quite technical – perfect for crit racing. And the compact nature of the venue makes it very spectator friendly as the whole track can be seen from any point on the perimeter. Like in the previous edition of the Odlo Cool Sprint HolyCrit, there was an inspiring undercard of races before the main events, as kids as young as three took to the track. Whether it was the littlest ones on strider bikes maybe not quite sure who or what all the cheers were for, or the more earnest pre-teens trying their hardest to win, the youngsters again provided the perfect warm-up for the adults. Those big boys and girls had a smorgasbord of competitive options from which to choose. In addition to the Men’s Open, the road bike category also featured Men’s Juniors (Under 21), Men’s Masters (40+), Men’s Sports, Women’s Elite and Women’s Sports races. 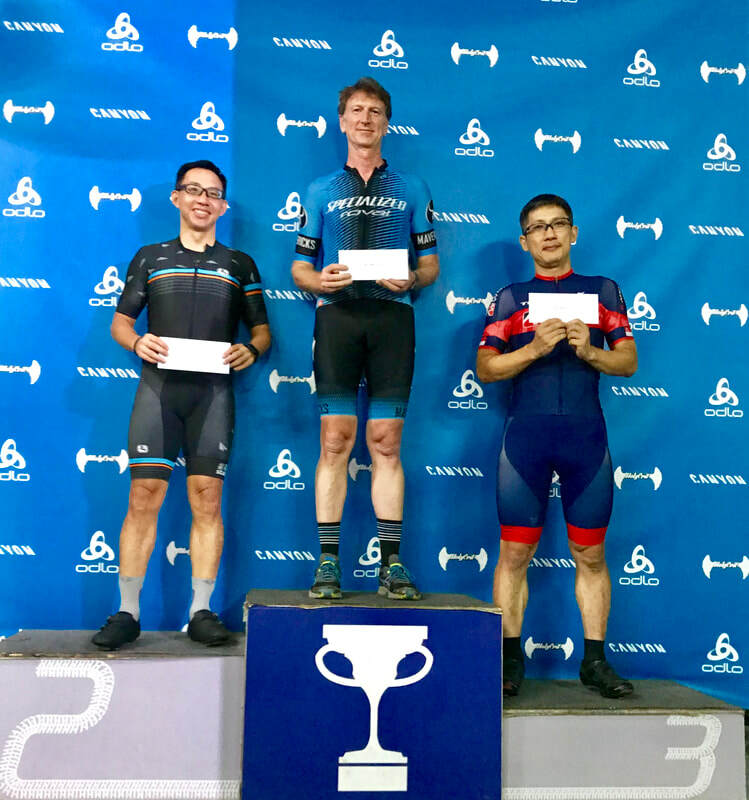 Of course, there couldn’t be a HolyCrit without an elite Fixed Gear race, but for the less-experienced riders from the fixie brigade, a Sports category was offered too. Rounding things out for the adults was a Men’s Mountain Bike Open. The format for all races at the Odlo Cool Sprints was five laps of the circuit. Due to big registration numbers, qualifying heats were required for three men’s races – Road Bike Open, Road Bike Sports and Fixed Sports. All other contests were straight finals. To qualify for the finals by rights was pretty tough, with only the first two going automatically through, but a generous wildcard system allowed a backdoor route to the finals for a lot of the riders and ensured any “star” names didn’t miss out on the action. ​While the previous two editions of the Odlo Cool Sprints had been raced in a clockwise direction, the track direction this time was switched to anti-clockwise. Mixing things up was a great idea, but the change probably deprived the crowd of more grandstand sprint finishes; a lap done clockwise ends with a fast, sweeping corner into the finishing straight, while the anti-clockwise lap has a tight U-turn that exits just a few metres from the line. Saturday’s crowd was still treated to a lot of late-race thrills as the lead riders in each contest fought to get into that final bend first, but nothing beats a high-speed blanket finish. That crowd was big and boisterous, and seemed to contain a lot of faces that would normally be seen on the track rather than on the sidelines. Maybe with the Tour de Bintan coming up this weekend some people weren’t taking any risks on a short-course format known to induce a crash or two. The heats took up the first part of the evening and then it was straight into the finals. It was no surprise to see the Mountain Bike race being dominated by the all-conquering Team Awano Treknology3 squad, but the order on the clean-sweep podium might not have been so predictable; claiming the rights to the top step this time was Muhammad Aidil Taufid Afendi, meaning his more celebrated teammates Riyadh Hakim and Junaidi Hashim had to make do with second and third respectively. While all the races on the tight karting track are a joy to watch, there’s something strangely special about watching the MTBers hurtling round the circuit, sitting high with their elbows stuck out. ​The Juniors final displayed a blend of fearlessness, speed and perhaps not-quite-the-skill-level to match the speed, and so a few spills were mixed in with the thrills. Emerging best from the madness and claiming the mantle of champion was Chester Wong (Geylang Cycling Team), with Nicholas Long (Integrated Riding) and Cheong Shun Ming (Singapore Polytechnic) rounding out the podium. The Men’s Masters final had a fitting winner in Richard Paine (Specialized Roval Mavericks), with the Australian making a claim for ownership of the Karting Arena track after another masterly performance which made it three wins out of three in the Odlo Cool Sprints. 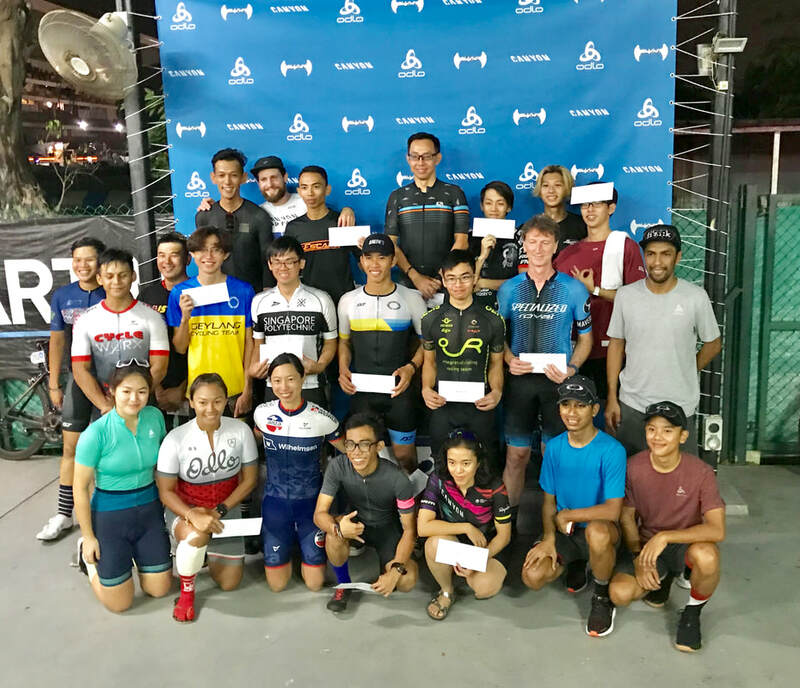 Paine’s perfect display of pace, poise and technical prowess saw him cross the finish line half a lap ahead of the runner-up Sai Keong Leong. Keiichi “Dr Avocado” Hayashi (Allied World Treknology3) rounded out the podium in third. 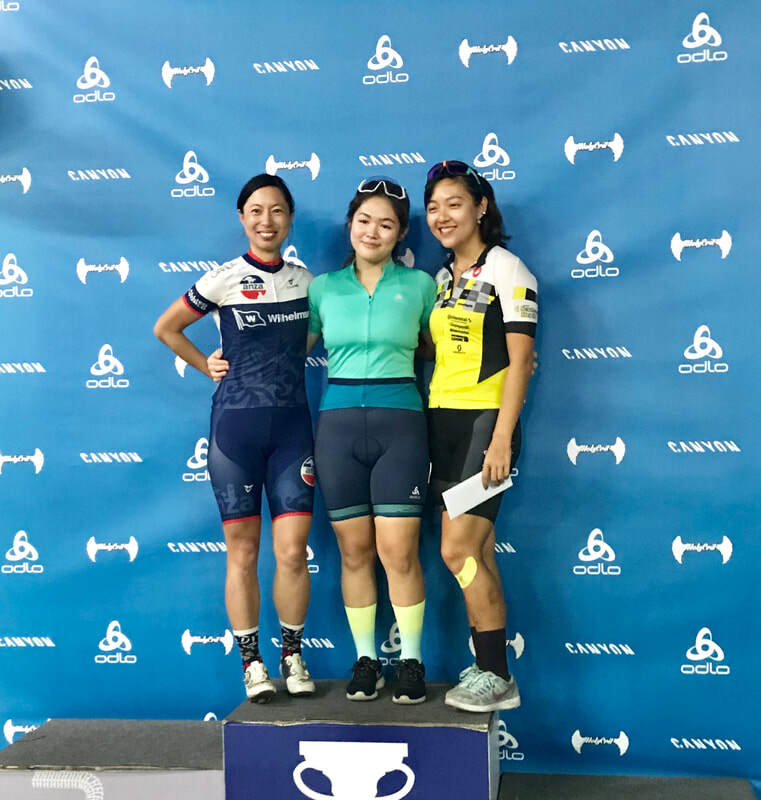 ​The Women’s Open crown went to Ashley Lui (Cycleworx), with the teenager dominating the contest from start to finish to defend her title with aplomb. There was a decent battle for second place, though, with Stephanie Lim (Anza Cycling) using good technical skills to edge the perhaps more powerful Sarah Tan (NewMoon KHCycle). The Women’s Sports champion was Yanee Ma, with Orca Woo in second and Fatin Liana in third. The Men’s Road Bike Sports final contained a few names that perhaps didn’t fit the description of an event open to “cyclists with no racing experience”. They know who they are, so hopefully they’ll step up to the Open category next time. Still, the Sports final proved to be an exciting affair, with the sizeable RoadBrothers contingent displaying some good tactics to dominate the race, which resulted in a one-two for the local team; Syazwan Radhi took the win, with teammate Asraf Shariff in second and Marcus Pang (Joyriders/Piston Racing) rounding out the podium. ​The Fixed Sports final was another cracker of a contest, and from the skill and speed on display it seems there were quite a few sandbaggers in this category too; the lead Fixed “rookies” were actually going faster than the Road Bike Open final riders who followed them onto the track. Justin Ong emerged as the champ, from Alvis Tay (Team Zone 1) in second and Richmond Yang (DOR) was third. If anything the Fixed Sports final was a more competitive contest than the Fixed Open final, with Fischer showing his class to dominate the latter. In the battle for the runner’s-up spot behind the German, it was Muhamad Irfan who took that honour from Jamal Wagiman in third. 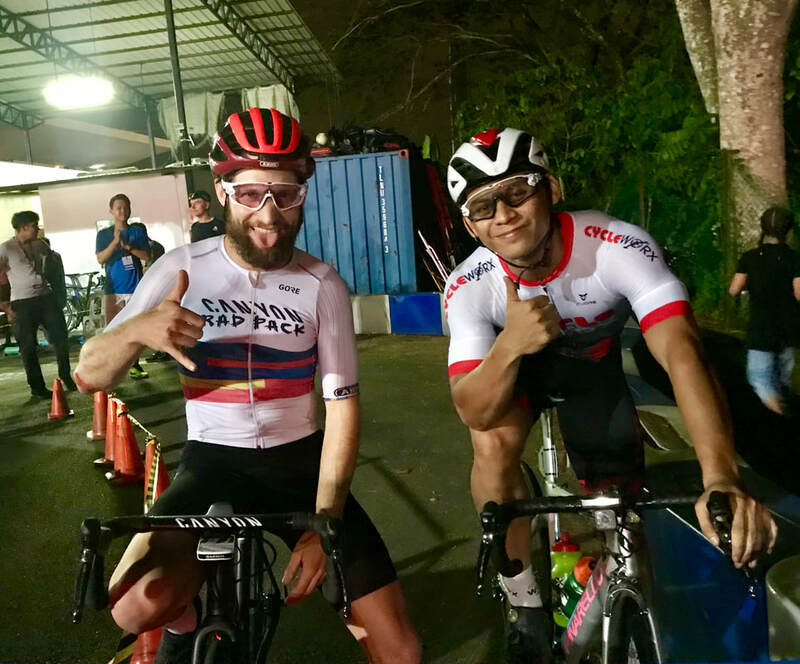 While Fischer left a big impression on Singapore, he seemed equally impressed with the Odlo Cool Sprint/HolyCrit event and the local cycling community. “I don’t think you can call HolyCrit grassroots anymore. I’ve known HolyCrit since three years ago when we were racing in Malaysia illegally in the middle of Kuala Lumpur where nobody else was there, but now this seems pretty professional and I like to see so many people, especially so many young kids as spectators cheering on their friends. It seems there’s just a new cycling culture rising here,” said Fischer, who incidentally won that HolyCrit race in KL. ​Fischer went on to compare the Singapore scene with what he’s used to back home in Germany. We asked Fischer what it was like to race on the tight Karting Arena track and got a surprising answer. “This track is great but it’s not tight at all. We organise a race, Rad Race organises a race in Germany on a go-kart track as well and it’s like half the size with nine turns, so this one was pretty wide and fast, I really like it, you could accelerate really well,” said Fischer, who finished our short post-race conversation by reiterating how much he’d enjoyed his Singapore experience. The grand finale of the latest edition of the Odlo Cool Sprint Challenge powered by HolyCrit was the Men’s Road Bike Open final and the top boys put on a thrilling show to close out the action. 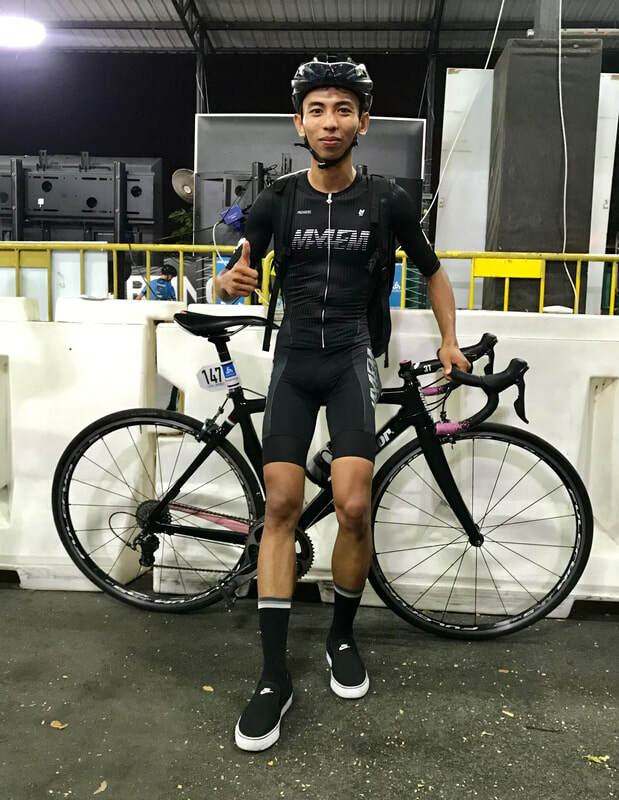 Among the dozen starters were defending champion Ghazzi Krisna (FuelledBySpeed), his twin brother Ghaffari, Luqmanul Hakim, Shafiq, Elyas and the fixed-gear king Fischer. ​Position is so important on such a short race and tight track, and the first three riders into the opening corner on Saturday never let any of the remaining riders pass them. That trio of Shafiq, Elyas and Ghaffari traded the lead among them, although it wasn’t a case of deliberate cooperation, rather it was a series of daredevil moves that caused the separation. Ghaffari enjoyed the early advantage and then as the race passed the halfway mark, Elyas edged ahead. He then swapped the lead with Shafiq on what seemed like every corner, but it was the Malaysian who hit the final tight turn first and he then held off the last desperate surge from the Singaporean to take the chequered flag. Post-race we asked the smiling champion why he raced road bike rather than fixed gear on this occasion. “I’ve been riding more road bike recently and so decided to do the road bike category tonight. But it was still a very tough race,” he said. Shafiq’s sentiment is shared by all connected to the Odlo Cool Sprint Challenge and HolyCrit, and the racers and fans will be eagerly awaiting confirmation of the rumours swirling that the next round of the series will take place later this year in and around the Singapore National Stadium. Related content: Click here to read the race report from the September 2018 edition of the Odlo Cool Sprint Challenge powered by HolyCrit.